Family is a central value for Jews and Italians alike�doubly so for Italian Jews! So let me tell you who I am by telling you a little bit about my family. My ancestors came to Rome from Spain, over five hundred years ago. My grandmother ran a licensed souvenir stand in the Vatican (a traditionally Jewish profession! ), which she passed on to my father, and my father to me. You could say that tourism and the city of Rome are in my DNA! A few years ago, I decided to take this family tradition to another level. Driven by my passion for the city of Rome, its landmarks, art and history, I decided to become a tour guide. I studied hard, taking courses in art history and archaeology, passed the gruelling regional exams�obtaining certification as a licensed tour guide�and immediately began working with some of the largest tour operators in Rome. Now, as an independent guide, I am able to offer my intimate knowledge of the city and its Jewish history (including Talmudic and Midrashic sources) in particular, directly to you. 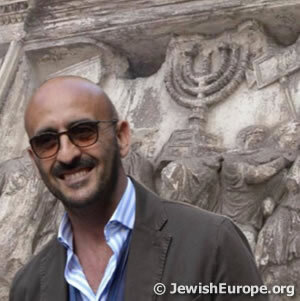 As a professionally trained tour guide and a graduate of the Rome Yeshiva who has deep roots in this city and its ancient Jewish community, I will show you Rome from a truly unique perspective. And now for the rest of the mishpacha�or famiglia, as we say in Rome: I am married to a fellow Roman Jew, of Ashkenazi heritage (a �mixed� marriage ?? ), and have two wonderful children, of whom I am immensely proud. Visit Rome�s historic Jewish quarter, including the Great Synagogue and Jewish Museum. Learn about the community�s ancient roots, struggles and triumphs throughout the ages. Explore Ancient Rome from a Jewish perspective, including many original discoveries! See the Roman Forum, Titus� Arch, the Colosseum, and Michelangelo�s �Moses�. Discover the mysteries of the Vatican, focusing on the Jewish influences hidden within its walls�including rumors and little-known secrets I have discovered over the years. Visit the Sistine Chapel and St. Peter�s Basilica, the Jewish Lapidarium, the Galleries of Maps, Tapestries and Statues, and the Hall of Busts. Particularly suitable for young children. Take a leisurely stroll through some of the city�s most famous sites--the Spanish Steps, the Trevi Fountain, the Pantheon and Piazza Navona�followed by dinner at one of the wonderful kosher restaurants in the Ghetto. Visit the the famous Jewish catacombs on the Appian Way�accessible only with an authorized guide. Gain invaluable insight into the lives and traditions of Jews in Ancient Rome. Give your feet a break and see Rome by Segway: Piazza del Popolo, the Spanish Steps, the Trevi Fountain, the Pantheon, Piazza Navona, Campo de� Fiori and the Ghetto. All tours are child-friendly and last between 2.5 and 3 hours. If you would like to get out of the city, try one of our day tours: Tivoli-Villa D�Este, the Amalfi Coast or the Castelli Romani. I also offer an airport pickup and drop off service, and can arrange for kosher Shabbat meals at local kosher restaurants or delivered to your hotel.